I often field questions from journalists when Notaries and notarizations get into the news. That happened this week when media reports surfaced that the Texas Secretary of State’s office is investigating the Notary involved in the $130,000 confidentiality agreement allegedly entered into in 2016 between an adult film actress and then-presidential candidate Donald Trump. The Notary faces possible revocation of her commission due to the apparent failure to complete notarial certificates for the two documents involved in this matter. The case also illustrates the problems that can occur when notarizations are not performed correctly. In this case, there are a number of questions about the so-called notarizations and whether the agreement is invalid as a result of problems with them. The actress, known as Stormy Daniels (whose real name is Stephanie Clifford), has filed a suit in a California state court seeking to invalidate the confidentiality agreement because the President did not sign it. 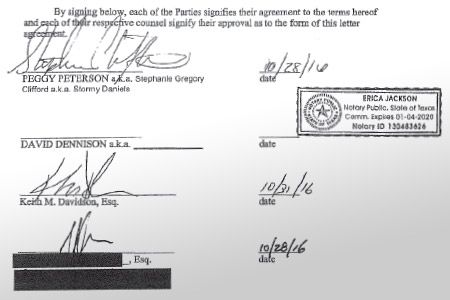 Both the non-disclosure agreement supposedly signed by the actress and an accompanying side letter, which are attached as exhibits to the lawsuit, bear a Texas Notary seal affixed on the signature page of each of the 2 documents. Those seals are the only indications that the 2 documents were notarized. There is no Notary certificate or wording connected to those seals and no Notary signature anywhere on the documents. The journalists who contacted me asked whether these “notarizations” were valid. After reviewing the actress’s lawsuit and the letter the Texas Secretary of State’s Office sent to the Notary, I immediately and firmly concluded the notarizations were invalid — although I cannot at this early time know for certain who was responsible for their faults. The first issue that arises is whether the Notary seal affixed was an authentic seal belonging to the Notary named in the image and whether the Notary actually affixed the seal impressions on the 2 documents. There have been numerous cases of wrongdoers forging or faking Notary seals to impersonate Notaries and/or forge notarizations. There also have been cases in which wrongdoers have stolen or otherwise acquired legitimate seals of Notaries and then used those misappropriated seals to impersonate Notaries and/or to forge notarizations. If these events occurred, the notarizations would be invalid. If the real Notary in this situation affixed the seals, the “notarizations” were nevertheless faulty and invalid for several reasons. First, the Notary did not prepare a notarial certificate as part of either notarization. Thus, the Notary did not identify the venue where the notarizations were performed, verify that the signer(s) were present at the time of the notarizations or verify which signatures were being notarized (since each document was signed by more than one individual). Second, the Notary did not sign either notarization. The failure of the Notary to do those two things is absolutely fatal. Next, the alleged notarizations were not dated by the Notary, so it is not possible to tell when the Notary seal was affixed — before, at the time of, or after the notarizations were performed. If the Notary seal were affixed before or after the documents were signed and/or without the knowledge of one or more of the document signers, the notarizations would be invalid. Texas Notaries are required by law to prepare a Notary journal entry for each of their notarizations, so the Notary should have completed two journal entries for each signer to record the notarizations in this case. In fact, the Secretary of State has requested that the Notary provide copies of those entries as part of its complaint review process. If no such entries were made, that omission will suggest very strongly the invalidity of the notarizations. I would also like to know whether the Notary had any connection to any of the parties or attorneys involved in this case, how and why this Notary was chosen, whether anyone influenced the Notary to simply affix her seal to the documents, whether the Notary realized the “notarizations” were faulty at the time they were performed and whether the Notary was compensated for these two “notarizations” (and if so, by whom, and for how much). The real concern is whether the invalid notarizations make the confidentiality agreement invalid (although the actress’s California lawsuit, as of this time, does not make such a claim). The agreement in question was a private contract that was not required by law to be notarized. Thus, it might seem that the faulty notarizations have no effect on the contract. However, to the contrary, it seems to me that a notarization either means something, or it does not. I believe a notarization is a quite consequential act. It is an official act of a duly commissioned and impartial public officer — a Notary Public. The purpose of a notarization is to bring a detailed and thoughtful procedure to a transaction to help protect the parties against hasty decisions and to ensure the mental competence and willingness of the parties. None of that apparently happened in this case of the cavalier, minimal, and hollow action of the Notary. When private parties mutually decide to have their transaction notarized, the notarization becomes a condition to their contract. If the notarization is invalid, the condition fails, and this failure either invalidates or at least substantially undermines the contract. This view is the only interpretation that gives substance and worth to the act of notarization. Otherwise, notarization is reduced to a meaningless formality. Yet, over the centuries, there have been legions of authoritative endorsements of the values of the notarization of documents. And, I heartily agree with that view. I hope the author of this article posts an update to what follows. Do we know if this was filed in California, or Texas? Is it possible the faulty notarization will affect the validity of the document or its signatures? And what are the possible outcomes? I noticed that there are three a.k.a: Peggy Peterson a.k.a Stephanie Gregory Clifford a.k.a Stormy Daniels. My concern is about the completion of an AKA Affidavit/Signature to which a person swears he/she is also known as. Was one done? If not why not? How can the notary be assured all three are the same person? What proper ID was shown to the notary? Was the person in the present of the Notary when it was signed? I also noticed that the signature is signed as Stephanie Gregory Clifford and not as Peggy Peterson. So many red flags in this case. This would be a good classic example to be included in a Notary class. No question about it.....this is a "no no" and the Notary should have known this. Each person must sign where a signature is required. Also, the clarity of these individual by signing "The One is Same" or "Also Know As" affidavit, which is very important when dealing with alias. It's okay to ask question about any document notarized so you can fully understand and make sure document is of legal intent. If I do not understand the verbiage in the documents, I will not Notarize. Before I sign any documents you must show me valid identification. No valid ID is a refusal to sign for me. My opinion after being a notary for years - this document should be classified as "Null and Void." It has no merit. 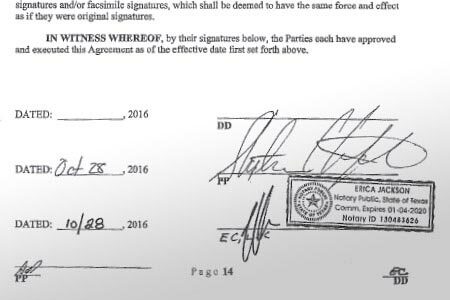 Why was the document signed in 2016 but the notary stamp expires January of 2020? Texas notary commissions are only good for 4 years. Which means that they just renewed and got their new stamp January 4th 2018. This was stamp sometime between now and January 4th of this year. While the notarization is clearly invalid, it seems to me that would only be an issue if one of the parties was claiming their signature was misappropriated, made under duress, or forged. Since no one is claiming that, and - indeed - all the parties have publicly declared the authenticity of their signatures, it seems the sloppy notarization is embarrassing but not much more. Wow, this notary is lazy and stupid. I would have gotten thumps prints and signatures for all the spaces they signed in the journal. Where's her signature? Erica Jackson should have thanked NNA classes!!!!!! When I read the Yahoo "revelations" about the Notarial error, I likewise questioned if the Seal was misappropriated or stolen. I cannot imagine a (good) Notary not completing the signature, attached documents and recording in Journal. Falsifying documents is a serious offense. First, why is it still being referred to as "Trump's Confidentiality Agreement" when it doesn't reflect Trump's signature? An AKA Affidavit/Signature form proves nothing if the person is lying in the first place. How do you execute a document "as of" an effective date in the first place. The date you execute it isn't necessarily the effective date but that is usually a reason for having an effective date in the first place: the effective date is different from the date of execution. 2016 to 2020 is four years if it is not outside the specific date. No guarantee someone didn't use a notary's stamp and not really knowing what notaries do or how they do it, thought that is all that is done...common misconception about notarization. @Diana Sotela - not sure I follow your math. If the commission is four years and it expires Jan 2020, wouldn't that mean the notary had gotten her new stamp in Jan 2016? "...substantially undermines the contract..." - really? This article, and the author's conclusions are contrived, to say the least - and relies on little more than (incorrect) assumptions. Perhaps the author should stick to teaching - and stay out smear politics.